The Apprentice is a Terrapin baker and minor boss featured in Super Mario RPG: Legend of the Seven Stars. He and his mentor, Chef Torte, bake cakes together in the Marrymore wedding chapel. Although Chef Torte constantly bosses around and insults his inexperienced Apprentice, the chef-in-training doesn't seem to mind the abuse. 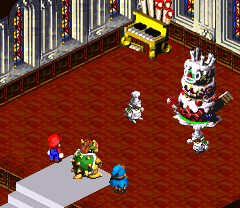 During the events of Super Mario RPG: Legend of the Seven Stars, Chef Torte and his Apprentice are charged with creating the world's greatest wedding cake for Booster and Toadstool's wedding, for which they eventually create Bundt. The two rush the cake over to the ceremony, but find it interrupted by Mario, who had rescued Toadstool and ended the wedding. Enraged by the idea that no one would taste their cake with the wedding canceled, both Chef Torte and his Apprentice attack Mario's party. In battle, the Apprentice attacks by slapping his opponents. Although his attacks are weak, the Apprentice and Chef Torte are invulnerable, requiring the player to attack the immobile Bundt instead. After taking enough damage, Bundt begins to move. The Apprentice notice this and taps his master on the shoulder, but Chef Torte, seeing Bundt immobile, dismiss him and resume battle. However, when the cake moves a second time, the Apprentice notices it again and advise his master. This time, however, Bundt continues to move and actually comes alive. Frightened, the Apprentice and his master flee the scene, leaving Mario and his allies to fight the wedding cake. Later in the game, Chef Torte and his Apprentice begin working on another wedding cake. Chef Torte and his Apprentice are both named "Torte" in battle. Compared to the Snifits known as "Apprentice," their Japanese names are spelled differently. The other Apprentice has their names spelled in Hiragana, to denote a childish attitude. Chef Torte's Apprentice has his name spelled in kanji, to denote a more mature individual. This page was last edited on March 30, 2018, at 18:34.